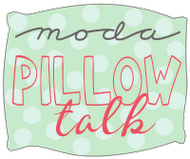 Back in October, Moda hosted two School House presentations at Quilt Market and asked each Moda fabric designer in attendance to make and present a pillow that describes our creative journey: our design process, our background, or something unique about us. The room was packed for both presentations, and we had a lot of laughs and learned quite a bit about each other while doing it. The pillows themselves turned out quite nicely, too. I hope you’ll join us! Can’t wait to show you my pillow and hear from a few designers who weren’t in attendance at the show. I would love a pillow fight with my grandson Iain, I would go down laughing.